I have no idea what is wrong with me. I have lived in Vancouver for most of my life, and for some reason, I only got to Butter Baked Goods and Cafe for the first time just a little while ago. I guess maybe part of the reason is because it’s in a tiny, slightly obscure neighbourhood in Dunbar, but still… really no excuse. If you’ve never been, you must check it out. It is 100 different kinds of adorable, and the variety of baked goods! Cookies! Cakes! Bars! Squares! And marshmallows–they’re kinda famous for those. 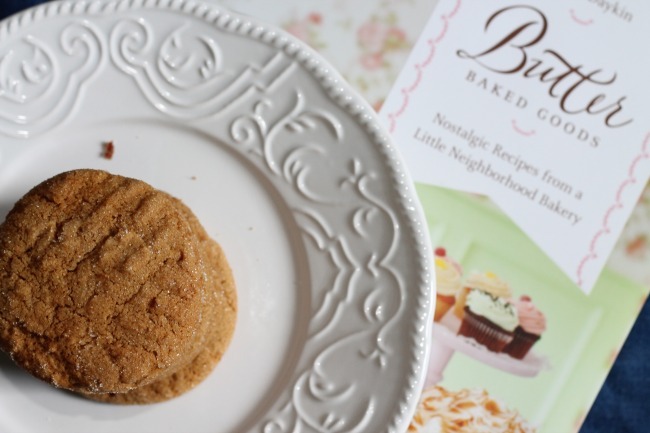 While I was there (the place, by the way, has a wonderful, vintage-y feel to it, it’s all cabbage rose wallpaper and pastels), I noticed that there was a cookbook, Butter Baked Goods: Nostalgic Recipes From a Little Neighborhood Bakery , and I knew I had to have it. This is not the kind of cookbook you’ll want to leave on your shelf. Mine has been gracing my coffee table since it came in the mail, and it’s not likely to be banished to the shelf any time soon. It’s really more coffee table book than cookbook, given its size, and the glorious colour photographs on every page. I decided the first recipe I’d test were the ginger cookies. Now, I’ve been clear about my cookie bias on this blog: I like them soft. I’m not a fan of a crispy cookie. Some crisp, yes, on the outside, but the inside needs to be warm and yielding, even gooey. These are not ginger snaps. They are ginger stamps. Rosie Daykin, the owner and head baker at Butter, nails the texture on these: the sugar coating gives them a crispy, slightly caramelized crust, but the insides are soft. My only complaint about this recipe was that it wasn’t gingery enough. I like a ginger cookie with a bit of a bite. 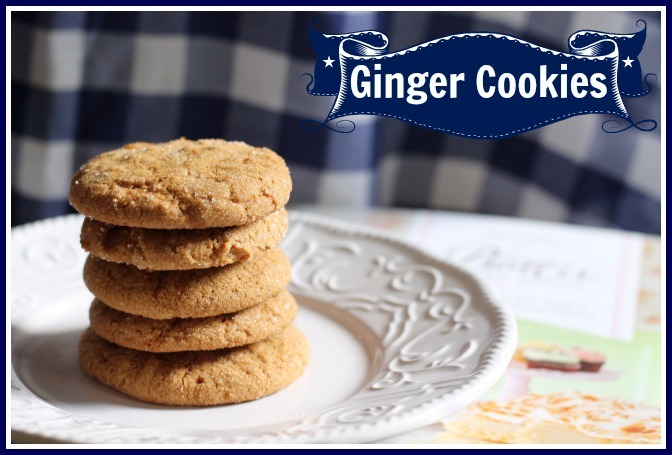 Now, it’s possible my ground ginger was old and lacked teeth, so I have two recommendations for you if you make these, and, like me, you like cookies that bite back a little. First of all, make sure you buy fresh ground ginger. I love Parthenon for their spices, and I’ve also been really happy with Ayoub’s as well, which is in my neighbourhood. Alternately, grate a little fresh ginger into the mix to kick it up a notch. If you have little kids, or you like your cookies less gingery, it’s good as is. In a large bowl, cream together the butter and 2 cups of sugar, until they are light and fluffy, scraping down the sides of the bowl if needed. Add the eggs one at a time, beating after each one. Add the molasses and the vanilla. Mix well until well combined, and the mixture is light in colour. In a separate bowl, mix together all the dry ingredients. Add them slowly to the wet mixture, 1/2 cup at a time. If the dough is a bit soft, put it in the fridge for an hour or so to stiffen it up. In a large, shallow bowl, place 1/2 cup of sugar. Roll the cookies into balls with your hands, and then roll them in the sugar. Place on a cookie sheet, and tamp them down slightly, either with your hand/fingers or a fork. Bake in a 350 degree oven for about 9-10 minutes for smaller cookies, or 15-17 minutes for larger (ice cream scoop sized) cookies. I loved this book! I will be experimenting with it for quite some time to come! Have any of you been to Butter? What was your favourite thing to eat there? These “ginger stamps” are absolutely the best…that from the BF who considers himself an authority no less! I also bought the book and will be trying many more recipes if this one is any indication of their quality. Thanks “Butter”. I love them but find when i get to the third tray they burn….not sure what i am doing wrong. i chill the dough? Sounds like it’s an issue with your oven, it gets too hot. Maybe turn down the temp or try baking the cookies higher in the oven?